Emerald and turquoise waters, heavenly beaches, exceptional nature, beach bars, seaside resorts for family holidays and a vibrant nightlife. Awarded with 33 Blue Flags in 2014, exotic Halkidiki gives you the gift of 550 kilometres of beautiful beaches! 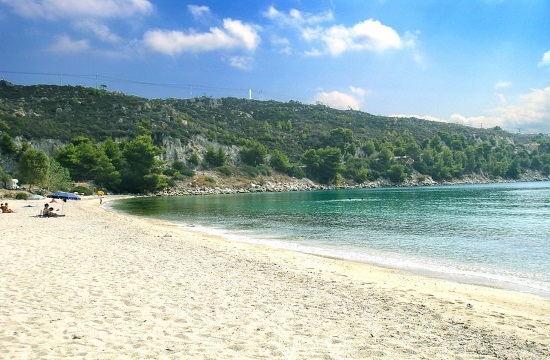 Nea Herakleia and Nea Kallikratia are both very popular, big beaches with white sand. They are fully-organised and perfect for families, while traditional little tavernas in the area serve delicious meze and Greek cuisine. Continuing further along you’ll encounter Nea Plagia, Flogita, Dionysiou Beach and Agios Mamas. Some are a little more and some a little less lively, but all are fully-organised, offering dozens of options for sea sports enthusiasts, as well as options for those looking for more privacy and tranquility in the little bays with the crystal clear waters hidden between them. Impressive and very long beaches with turquoise waters, fully-organised with beach bars and water sports. From Sani, Fourka, Possidi, Paliouri, Kallithea, to Pefkohori, Polychrono, Hanioti, and Kriopigi… Kassandra will enchant you. Endless hours at the beach, family-friendly facilities as well as a cosmopolitan atmosphere, surrounded by lush, green nature that highlights the turquoise waters. Explorers big and small can also discover quieter beaches, such as Mola Kaliva, Nea Skioni, Glarokavos. The coves at Kavourotripes and Karidi, with their emerald waters and powdery white sand, will steal your heart. As will famous Kalogria, the pine-studded bay of Koviou Beach, Paradisos Beach, and fully-organised Nikiti that spans kilometres. Sarti is a magnet for surfers, or perhaps you’ll prefer the beautiful beaches of Porto Carras, Spathies, Elia, Kalamitsi, and Agios Ioannis. You’ll swim under the archaeological site of Toroni, and in Porto Koufo, under the ancient port of Toroneos, where you’ll be thrilled by the scenery: the two protective arms of the cliffs embrace the port, leaving an opening of about 300 metres. In Sithonia, the large camping sites with their spectacular beaches – Armenistis, Koutloumousiou Beach, Kalamitsi – are all institutions. As are the beach bars where you’ll experience some of the best moments of your holidays, drinking shots and cocktails, dancing barefoot in the sand until nightfall. Sithonia is also an ideal family holiday destination, offering thousands of options for accommodations, food and fun – it’s a child’s paradise all day long. Hidden between the more popular beaches, there are gems like Aretes, Mikri Elia, Azapiko, Abelos, Diaporti with the islet of Pounta – that will become your treasured little secrets. Ouranoupoli, the gateway to the monasteries of Mount Athos, with its impressive tower and long, organised coastline, and the islets of Ammouliani and Drenia with their emerald waters, steal the show in the northwestern side of Halkidiki. The beaches in Kambos, Ierissos, Pyrgos, Develiki, Kastri, Vina, Xiropotamo, Tripiti will prove that even the less popular side of Halkidiki has a unique beauty. The beaches of Pisina and Sykia will give you the chance to swim with a view of ancient Stagira, where the ancient Greek philosopher Aristotle was said to be born in 384 BC.